Yes, as we are working our way into mid-September we have to start pulling that s-word back out - snow! Back on this day in 1916, the Twin Cities picked up a trace of snow, making it the earliest recorded snowfall in St. Paul history. A trace was also recorded in Duluth and International Falls, with 0.3" falling in Warroad. 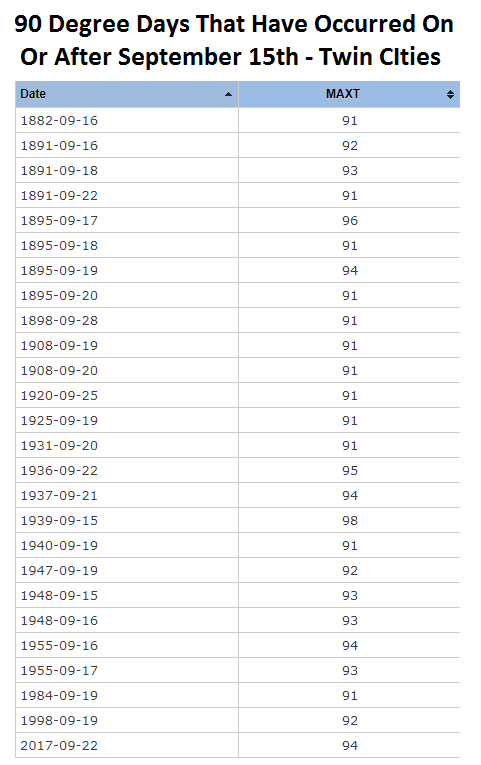 If we want the first measurable snowfall (greater than a trace) in Twin Cities history, you'd go back to 1985 when 0.4" of snow fell in the Twin Cities. Don't worry though - I don't have snow in the forecast anytime soon! 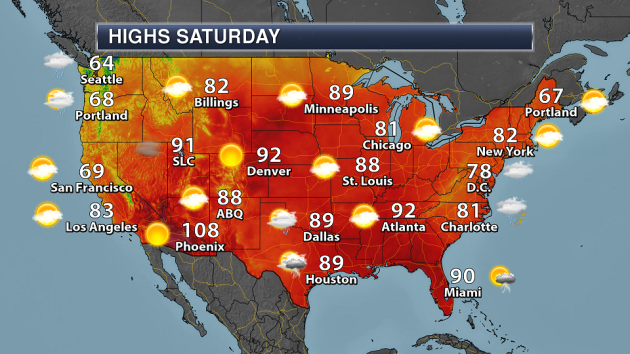 Meanwhile, looking at the other side of the spectrum, there's the potential we could hit 90 Saturday in the Twin Cities. If we were able to accomplish that, it would only be the 27th time in recorded history that we've observed a high of at least 90 on or after September 15th. It would also tie for the 21st latest last 90-degree day on record. We did see a late 90-degree day last year as well, as the thermometer hit 90 on September 24th. Our average last 90-degree days? August 27th. While the thermometer may not be reading like it the past few days, we are quickly working our way into fall with the Autumnal Equinox next Saturday. That means we are heading toward cooler days and the leaves changing colors over the next several weeks! You’ll have to wait a little bit for the leaves to change across southern Minnesota, though, as the typical peak isn't until late September through mid-October. We’ll remain warm as we head through the weekend including potentially hitting 90 Saturday, but highs more typical of mid-September return mid-next week with highs in the 60s and 70s. Rain chances return Monday and Monday Night and then again Wednesday into Thursday. SATURDAY: Feels like summer! Mainly sunny. High 89. Low 69. Chance of precipitation 0%. Wind S 5-10 mph. SUNDAY: Mainly sunny. Still humid. High 85. Low 68. Chance of precipitation 0%. Wind S 10-15 mph. MONDAY: Sunny start. Late day storms. High 82. Low 61. Chance of precipitation 50%. Wind SW 5-10 mph. TUESDAY: Cooling down. A few lingering rumbles. High 72. Low 53. Chance of precipitation 20%. Wind N 10-15 mph. WEDNESDAY: Storm chances return, mainly in the PM. High 68. Low 57. Chance of precipitation 50%. Wind SE 5-10 mph. THURSDAY: Widespread showers and storms. High 71. Low 58. Chance of precipitation 60%. Wind SE 10-15 mph. FRIDAY: Lingering AM storm. Cloudy and cooler. High 65. Low 50. Chance of precipitation 20%. Wind N 5-15 mph. 1939: Minneapolis experiences a daily record high of 98. 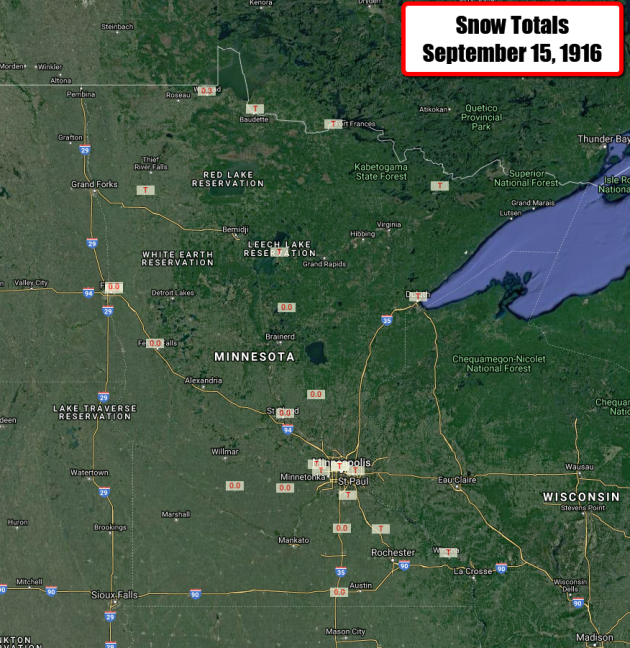 1916: St. Paul receives their earliest recorded snowfall. 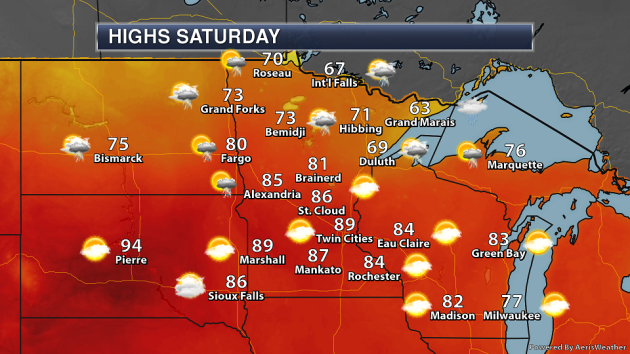 Enjoy a hot and humid day across southern Minnesota Saturday as highs climb into the 80s and potentially low 90s in spots. Northern Minnesota will be a bit cooler on the other side of a quasi-stationary frontal system with highs in the 60s and 70s. That's also where the chance of a few showers and storms will exist. Highs will be a good 10-20 degrees above average Saturday across the southern third of the state, with temperatures closer to average in northern portions. 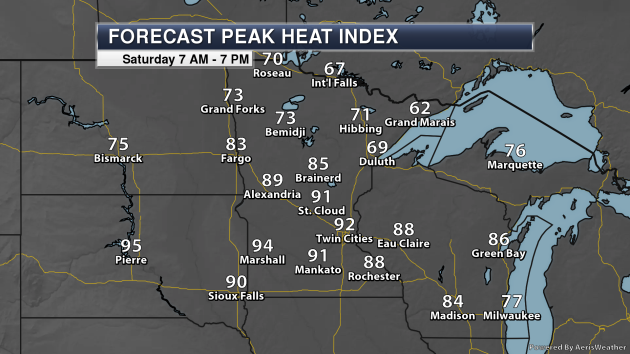 When you factor in the dewpoint, however, it will feel like the low to mid-90s across parts of southern Minnesota Saturday. The stalled front moves north Sunday, meaning most of the state will see highs climb into the 80s for the second half of the weekend. A few storms may be possible in far northern portions of the state. 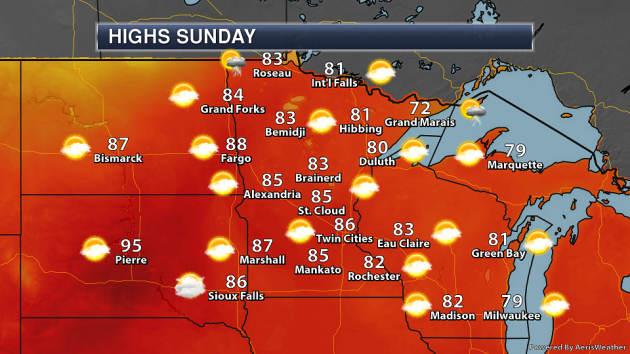 With humid conditions sticking around, it'll still feel like the upper 80s at times during the afternoon hours Sunday across southern Minnesota. 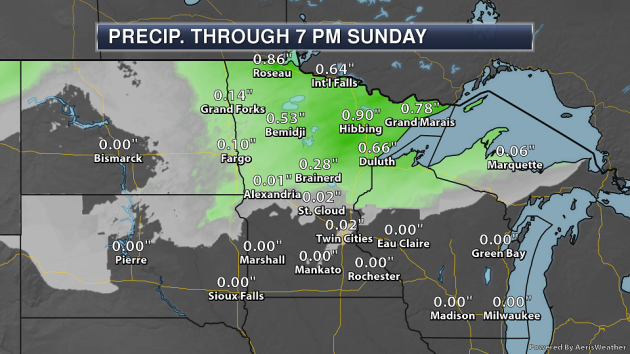 Through Sunday evening, the northern half of Minnesota will have the greatest potential of accumulating rain, especially Friday Night through Saturday Night. Up to an inch of rain may fall in spots. 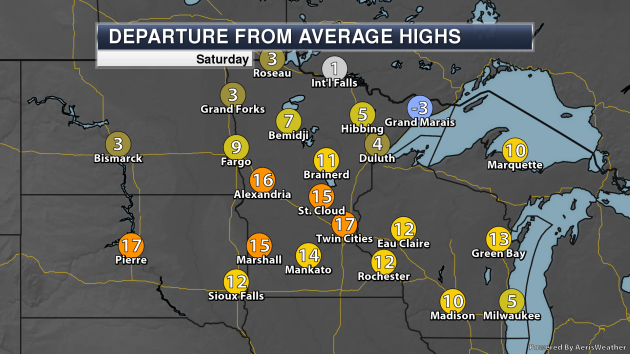 Looking at the Twin Cities temperature trend... enjoy the warm weather through the weekend and into early next week, as a big change is in store by the middle of the week through at least next weekend. Highs then will only be in the 60s and 70s. We are watching a few rain chance across the Twin Cities in the next week and a half - one coming through Monday and Monday Night with the cold front, another Wednesday into Thursday with a system passing through, and another system looks to aim toward the upper Midwest next weekend as well. While Florence will continue to impact the Mid-Atlantic Saturday, there are a few other stories across the nation. Another system that we had been tracking across the Gulf has moved inland across Texas, bringing heavy rain along with it. A semi-stalled system across parts of the upper Midwest could spark off a few showers and storms at times. A trough of low pressure approaching the Pacific Northwest could bring rain to areas like Seattle and Portland. Two areas of very heavy rain are possible through Wednesday morning across the nation. One is across the Mid-Atlantic and Northeast, courtesy of Florence. The other is across Texas due to that system which move inland. Hurricane Florence made landfall Friday morning at 7:15 AM ET as a Category 1 hurricane with 90 mph winds. 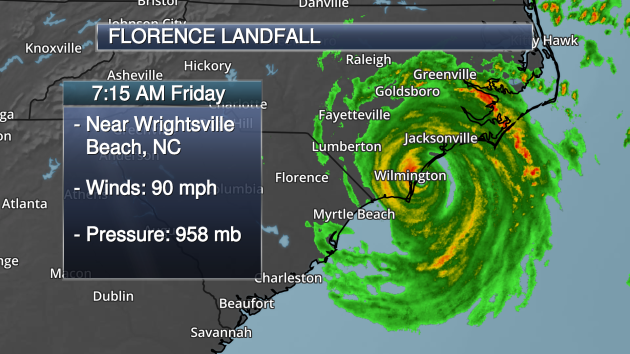 Florence made landfall near Wrightsville Beach, NC. 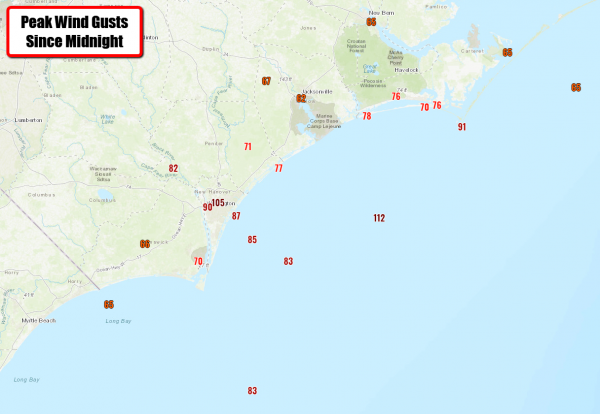 Around the same time, a wind gust of 105 mph was recorded in Wilmington. 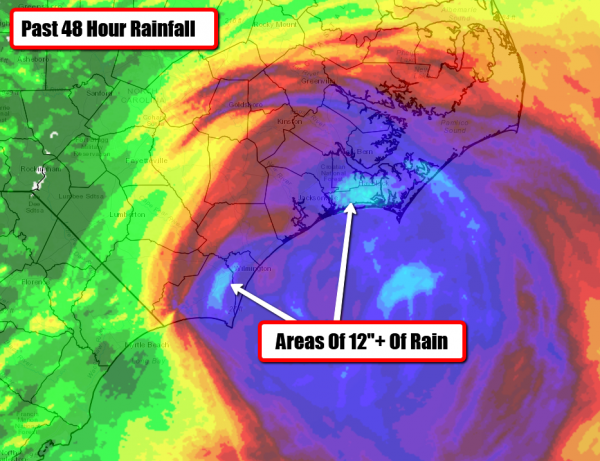 Here's a loop of Florence as the system was making landfall Friday morning across North Carolina. There is more on Florence below. Storm Surge Flooding. 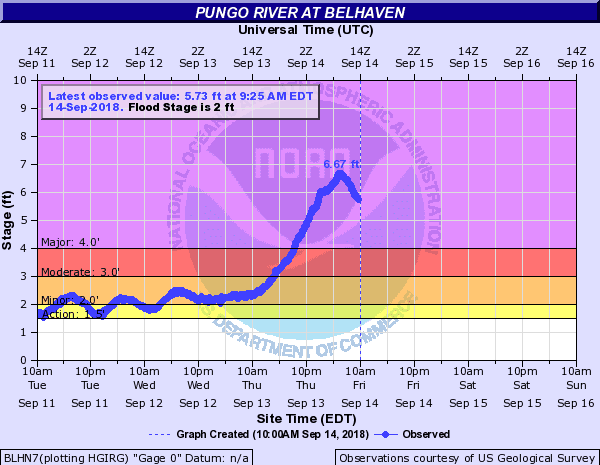 Major storm surge flooding is also occurring along the coast and inland rivers due to Florence, with the Pungo River reaching a height overnight of 6.67 feet. As the Neuse and Trent rivers rose last night in the New Bern area at least 200 people had to be rescued. Additional storm surge flooding is likely across the region later today, especially around the next high tide early this afternoon. Flash Flood Warnings And Emergencies. Due to the very heavy rain across the region so far in association with Florence, numerous Flash Flood Warnings have been issued. 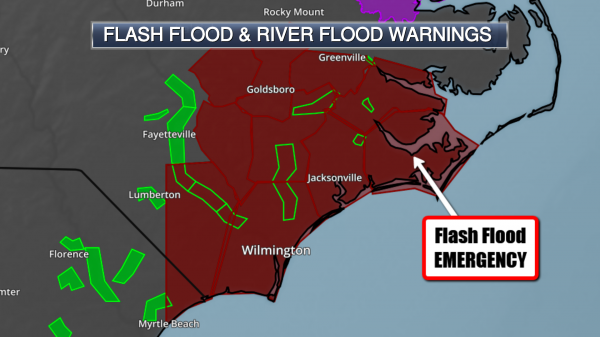 Due to heavy rain of 8-12” and storm surge flooding, a Flash Flood Emergency has been issued for parts of Carteret, Craven, Pamlico, and Jones Counties in North Carolina until 1 PM. That warning states that additional rainfall amounts of 3-6” are possible. Power Outages. Due to the high winds and flooding, numerous power outages are being reported across parts of the Carolinas. As of 10:20 AM ET, over 481,000 customers in North Carolina and over 37,000 customers across South Carolina had no power. The hardest hit areas have been in western parts of North Carolina and in northeastern parts of South Carolina. You can view this map and links to local power companies at poweroutage.us. Forecast Track. Florence will slowly move west to west-southwest over through Saturday, continuing to lash portions of North and South Carolina over the next several days. 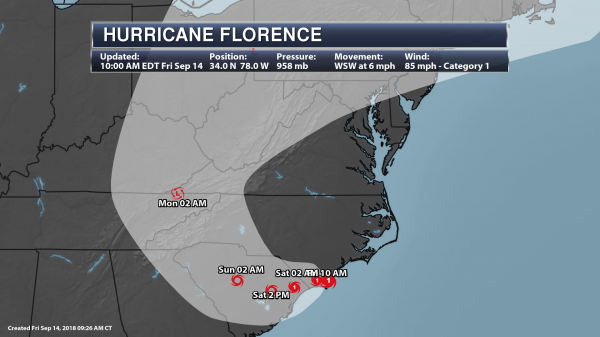 Later in the weekend, Florence will start to move north across the western Carolinas and into the central Appalachian Mountains into next week. Florence will continue to weaken as this storm moves inland throughout the next several days, becoming a tropical depression by Monday morning. More from the Durango Herald: "Two of the largest trees in the state of Colorado fell victim to the flames of the 416 Fire, a flyover of the burn scar revealed last week. Since the outbreak of the 416 Fire in June, forest researchers have wondered whether the record-setting trees in the Hermosa Creek drainage survived, said Gretchen Fitzgerald, a forester for the U.S. Forest Service. “We had some hope,” Fitzgerald said Tuesday. The Hermosa Creek drainage, about 20 miles north of Durango, is considered a prime spot for big trees to grow because of the combination of fertile soil, moist air and protection from severe weather patterns, Fitzgerald said." More from Scientific American: "The Outer Banks, and other barrier islands along the North and South Carolina shorelines, may see some of their worst storm-related damage in years as Florence approaches the coast, experts say, due to a combination of high winds and catastrophic storm surge. In fact, these islands are doing what they’re naturally made to do—buffer the inland shore against the impact of major storms. But scientists are worried that the barrier islands, some of the East Coast’s most important natural defenses, may be in serious jeopardy. The influence of human development on the islands, combined with the relentless progression of sea-level rise, is threatening to sweep them away. If so, storms like Florence could have an even bigger impact on the Carolina coastline in decades to come." More from WIRED: "Cities are also now serving as a unique testbed for responses to climate change—bolstering public transportation, erecting more efficient buildings, deploying renewable energy. Instigating those projects is the mission of C40, a coalition of international cities working to cut down on greenhouse gas emissions, no matter what their own national governments may be up to. Today, as politicians, business leaders, and activists gather for the Global Climate Action Summit, in San Francisco, C40 is announcing that 27 cities—including New York, London, and Rome—have reached a peak in emissions, and have seen at least a 10 percent drop from their peak. That’s a big deal in the fight against climate change. But how do you go about measuring the emissions of an entire city? Sadly, it’s not about putting scientists in balloons and floating them over a metropolis to take readings. Instead, cities report several metrics to C40. For example, you’d look at how much energy buildings are using. You’d also consider how much fuel the citizens are buying. Transport is a big one too—so rail and, if you’re on a river or the coast, water transportation." Thanks for checking in and have a great Saturday! 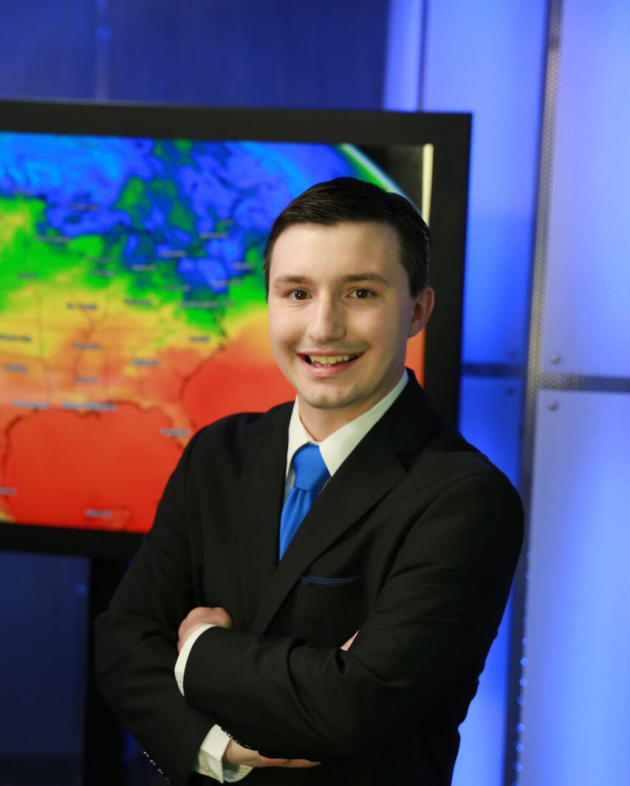 Don't forget to follow me on Twitter (@dkayserwx) and like me on Facebook (Meteorologist D.J. Kayser)! A Touch of July Heat Here - Dangerous "Florence"